The degradation pattern of human α-thrombin to less active forms is illustrated above. β-thrombin is generated by cleavage of the intact B-chain at the Arg106-Tyr107 bond to yield the B1 and B2 fragments. γ-thrombin is generated by further cleavage of the β-thrombin B2-chain at the Lys190-Gly191 bond to yield the B4 and B5 fragments. Although not illustrated, the B3 fragment is a potential intermediate that is derived by cleavage of the intact B-chain at the Lys190-Gly191 bond, resulting in a product that is often referred to as β'-thrombin. (The amino acid numbering used here begins at the NH2-terminal end of the A-chain and continues through the B-chain). Alpha-thrombin is a highly specific serine protease generated by proteolytic activation of the zymogen prothrombin (1). Purified forms of α-thrombin have been shown (2-4) to undergo autolysis upon long term storage to less active forms. Similar inactivation was observed upon limited digestion of a-thrombin with trypsin (5). These proteolyzed forms of α-thrombin have been termed β-thrombin and γ-thrombin. Human β-thrombin is generated by cleavage of the B-chain at the Arg106-Tyr107 bond. γ-thrombin is generated by further cleavage of the β-thrombin B2-chain at the Lys190-Gly191 bond. Another form of proteolyzed thrombin, termed β'-thrombin is formed by the single cleavage of thrombin at Arg-154. γ-thrombin is produced by proteolytic cleavage at both of these sites (Arg70/73 and Arg-154) in the B-chain. These cleavages cause release of peptides that are no longer covalently attached to the thrombin molecule, but remain associated through ion exchange and gel filtration chromatography. These proteolyzed forms of thrombin retain their ability to cleave small synthetic substrates (6,7) and some protein substrates such as factor XIII (8), antithrombin III (9) and prothrombin (10). Their ability to clot fibrinogen (11), cleave thrombospondin (12) or activate protein C (9) have been markedly decreased. Human β-thrombin and γ-thrombin are prepared from purified a-thrombin by limited proteolysis with TPCK-treated trypsin, essentially by the method of Braun et al. (5). The proteolyzed forms of a-thrombin are supplied in 100 mM NaH2PO4, pH 6.5 buffer and should be stored at -20ºC. 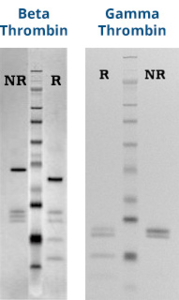 Purity is assessed by SDS-PAGE and activity is assessed using a fibrinogen clotting assay. Other contaminants are of thrombin origin, and may make up to ~5% of the additional band mass. Proteolyzed forms of -thrombin which retain activity toward small substrates, factor XIII and prothrombin, but have reduced activity toward fibrinogen, protein C activation and antithrombin III binding. b-thrombin: three chains (A, B1, B2), disulfide link between the A and the B2 chains. g-thrombin: four chains (A, B1, B5, B4) with a disulfide link between the A peptide and the B5 peptide. Lundblad, R.L., et al., Methods Enzymol., 45, 156 (1976). Lundblad, R.L., et al., J. Biol. Chem., 254, 8524 (1979). Fenton, J.W., et al., in Chemistry and Biology of Thrombin, ed. R.L. Lundblad, J.W. Fenton, K.G. Mann, pp. 43-70, Ann Arbor, MI: Ann Arbor Science Publishers, Inc., 1977. Boissel, J.P., et al., J. Biol. Chem., 259, 5691 (1984). Braun, P.J., et al., Thromb. Res., 50, 273 (1988). Lottenberg, R., et al., Thromb. Res., 28, 313 (1982). WittiNg, et al., Thromb. Res., 46, 567 (1987). Lorand, L. and Credo, R.B., in Chemistry and Biology of Thrombin, ed. R.L. Lundblad, J.W. Fenton, K.G. Mann, pp. 311-323, Ann Arbor, MI: Ann Arbor Science Publishers, Inc., 1977. Bezeaud, A., et al., Eur. J. Chem., 153, 491 (1985). Seegers, W.H., et al., Semin. Thromb. Haemostasis, 1, 211 (1975). Lundblad, R.L., et al., J. Biol. Chem., 259, 6991 (1984). Takahashi, K., et al., Biochem. J., 224, 673 (1984).